These are delicious, crunchy, moreish little chickpeas with a lovely spicy coating. Serve them as a tasty pre-dinner snack or stash them in your lunch box for a great healthy snack. You can buy very similar snacks in the supermarket now for vast amounts of money - don't bother these are way better and very cheap to make! Drain the chickpeas well and blot off any excess water with kitchen roll (this will help them go really crunchy). Tip them into a bowl and coat with the olive oil, paprika, garlic and salt to taste. Spread them out on a large baking tray so that there is enough room for them to roll around a little and pop in the oven. Roast for 30-40 minutes, shaking the tray gently every 15 minutes. The chickpeas are done when shaking the tray makes them rattle against it. Spicy Indian - switch the paprika for 1 teaspoon of turmeric and also add 1/2 teaspoon each of cumin, ginger and coriander. Sweet Chilli - use 1 tablespoon sesame oil and one of sunflower oil. Add 1/2 teaspoon each of dried chili flakes, ginger and garlic. Roast until almost done then add one tablespoon of sweet chilli sauce and stir to coat the chickpeas. Pop back in the oven for 5 minutes until the sauce caramelises (but remove before it scorches!). 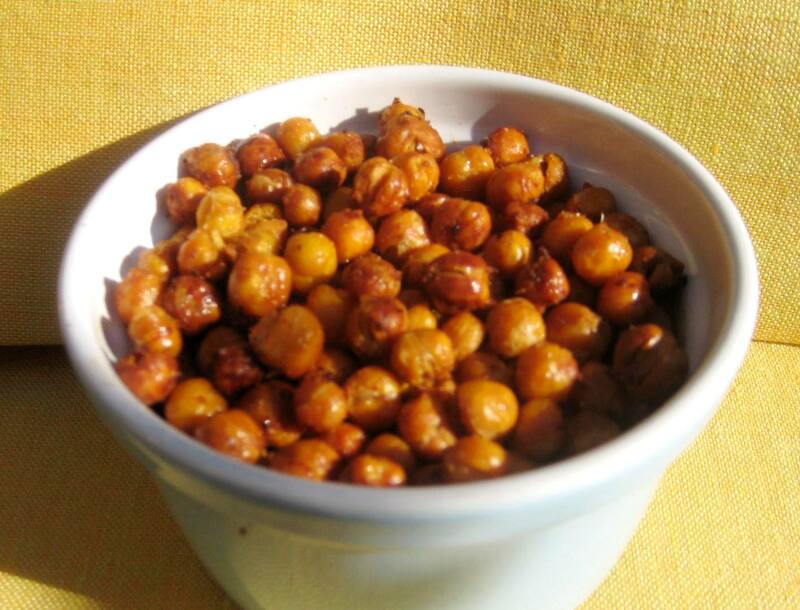 Chickpeas are a great sustaining snack as they are a good source of fibre and a good vegetarian source of protein. They will help give you a long lasting energy boost whilst satisfying that snack urge. Chickpeas are also a good source of folate for those of you taking drugs like methotrexate.Cooking them with olive oil means you are getting a dose of healthy monounsaturated fat and adding spices (like paprika, which contains capsaicin) gives them an added anti-inflammatory boost.